Spanish with "Hola me llamo" text. The template can also be used to create labels, place cards, etc. The premium version of the name tags is editable in Adobe Reader. Just open the file, type your text, and print. Learn More This version also removes the watermarks present in the free version. Download the free version of the name tags. Note that the free version includes a watermark on each tag and isn't editable. Download the PDF file for the name tag. Open the file in a PDF reader such as Adobe Reader. Click the text in a highlighted field to edit it. Remove the 'Type name' text. Replace it with a name or other text. The text will shrink as you add more characters to accommodate longer names. Use the tab key to easily move from one field to the next. Note that only the content of text is editable. The font and color are set and can't be changed. We also have an article with image examples to explain this step in more detail. Print on heavy card stock for best results. Sticker paper may also work, but we haven't tested it. Depending on the number of name tags you need, you may have to print several copies. Make sure you set the size (or scaling) to 100% in your printer settings so the name tags print at the correct size. You should have an option in your printer settings to print at actual size. Write names on each name tag. Be sure to adjust the size of your writing to account for longer names so they will fit in the available space. Cut out name tags with a paper trimmer or scissors. Pin the name tag on. There are also name tag holders that will work with these name tags if you want a more durable result. These can be used to create clip-on name badges or hanging name tags with lanyards for wearing around the neck. You may use the name tags for non-commercial purposes only. 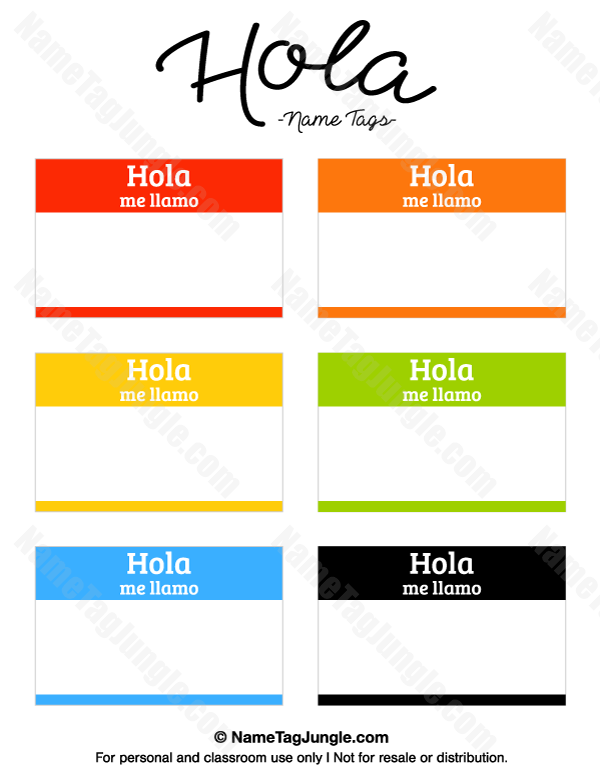 Teachers may use the name tags for students in their classroom. Other allowed uses are reunions, weddings, church, sports, etc. No commercial use is allowed. You may not distribute the digital file for the name tags.